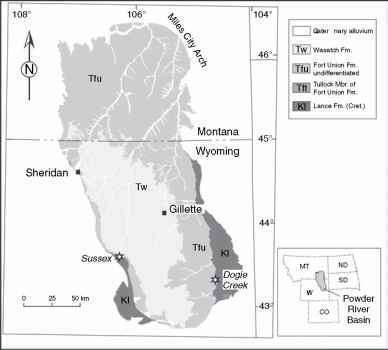 In this chapter, we discuss some of the other well-documented K-T boundary localities in North America outside of the Williston Basin. These localities are situated in other sedimentary basins in a south-to-north corridor from New Mexico to Alaska, including parts of western Canada (Figure 7.1). Collectively these localities contribute to a large database of information about plants and the K-T boundary, although it will became clear to the reader that the quality of the records varies from one to the next. The south-to-north geographic distribution of these basins constitutes a proximal-to-distal array with respect to the postulated K-T impact crater on the Yucatan Peninsula of Mexico. This fact appears to have particular relevance with respect to preservation of a boundary claystone layer and other indicators of the K-T boundary discussed in Section 2.3, such as shocked minerals.